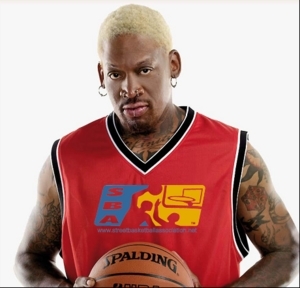 Washington,DC The Street Basketball Association and the SBA Sports Management and Entertainment Group are pleased to announce that celebrity superstar and 5-time NBA Champion Dennis Rodman will headline the upcoming SBA Show European Tour featuring the SBA All-Stars and former NBA Players Tim Hardaway, Muggsy Bogues, Dale Ellis, and Tracy Murray. The SBA is managing and directing the tour, featuring a 10-player team roster consisting of 5 former NBA Stars and 5 SBA All-Star Street Ball Legends from November 9th - November 16th. Weekend Slam Dunk Champion, and a NBA All-Star Weekend 3-Point Shootout Champion. Basketball for the Street Basketball Association. Along with 5-Time NBA Champion Dennis Rodman, 5-Time NBA All-Star and Olympic Gold  Medalist, Tim Hardaway, and fan favorite Muggsy Bogues, as the most well known of the  former NBA Stars, the SBA has assembled one of the most explosive SBA All-Star Teams  ever. SBA All-Stars Hot Sauce, Air Up There, aka Mr. 720, Baby Shaq, Pat Da-Roc, High  Rizer, Air Bama, Aggressor, and 7 & Sum Change will bring the additional entertainment  value and overall exposure that will fuel the anticipation from the fans throughout Europe  awaiting the SBA Show Tour. This will be the first time for some to see some of their favorite former NBA Stars and Street Ball All-Stars in person on one team instead of on the television or internet. “Fans all over the world have always treated us great and we are eagerly looking  forward to entertaining the crowds in Europe and putting on a show,” states SBA All-Star Pat Da-Roc. The SBA has partnered with European Sports Promotions Company, Global Projects, securing shows in Antwerp and Charleroi, Belgium and Trier, Germany November 9 - November 16, 2009. The SBA anticipates extending the tour throughout the month of November with additional shows as the SBA is currently having ongoing discussions with several European Clubs, Teams, and Sponsors interested in promoting the SBA Show European Tour. With the SBA, organizations looking to host the Tour will have the opportunity to align themselves with the explosive international growth of the SBA. The SBA continues to be a valuable asset for top businesses, companies, promoters, sponsors, teams and leagues throughout the world seeking basketball/street basketball consultation, development, event/tour management and marketing support. Founded in 2001, the Street Basketball Association has spearheaded the growth and development of the basketball industry globally producing countless events throughout the United States, South America, Europe, Asia, and Africa from tours, shows, and demonstrations, to competitions, clinics, and expos entertaining and educating fans worldwide. The SBA continues to be a leader in the Basketball development/promotions industry globally implementing and offering innovative and creative basketball sports/entertainment properties to the world.